The moon reached last quarter just after midnight last night, so for the next couple of weeks the early evening hours will be devoid of moonlight and therefore beautifully dark, writes Ian Griffin. This means it's an ideal time to head out after dark and explore the night sky. This week I would like to draw your attention to some fascinating constellations on show in the northern sky. Our chart is drawn for 11pm, by which time the sky should be nicely dark. Find yourself a nice spot away from streetlights with an unobstructed northern horizon and then park yourself in a comfortable deckchair. At 11pm, the bright star Procyon is some 40 degrees above the northern horizon. 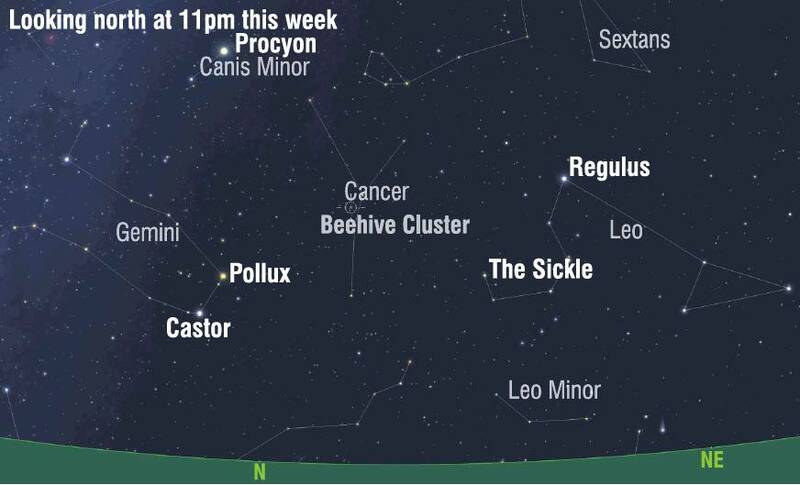 Procyon is in the constellation Canis Minor (the little dog). It is the eighth-brightest star in the sky, and, at a distance of 11.46 light years, is one of the closest. Procyon has a distinctly white hue. If you cast your gaze down towards the horizon you should be able to spot two bright stars. The higher is the yellow-orange Pollux, and the lower is another white star called Castor. Castor and Pollux are the brightest stars in the constellation Gemini, the twins. Once you have found Castor and Pollux, turn your head to the right; you should be able to pick out a distinctive curved chain of stars which collectively make up ''the sickle'' (which also looks like a fishhook). Ancient astronomers thought the sickle depicted the head of Leo, a giant celestial lion. The brightest star in the sickle is Regulus, which shines with a blue-white colour. Regulus is nearly 80 light years away from us, which means that the light you see when you look at it started its journey in 1939. Between Gemini and Leo is the constellation Cancer, the crab, and at first glance this part of the sky may seem a little disappointing since it is devoid of bright stars. However, if you do have a pair of binoculars handy it's well worth scanning Cancer to see if you can spot ''the beehive'', a beautiful condensed star cluster.